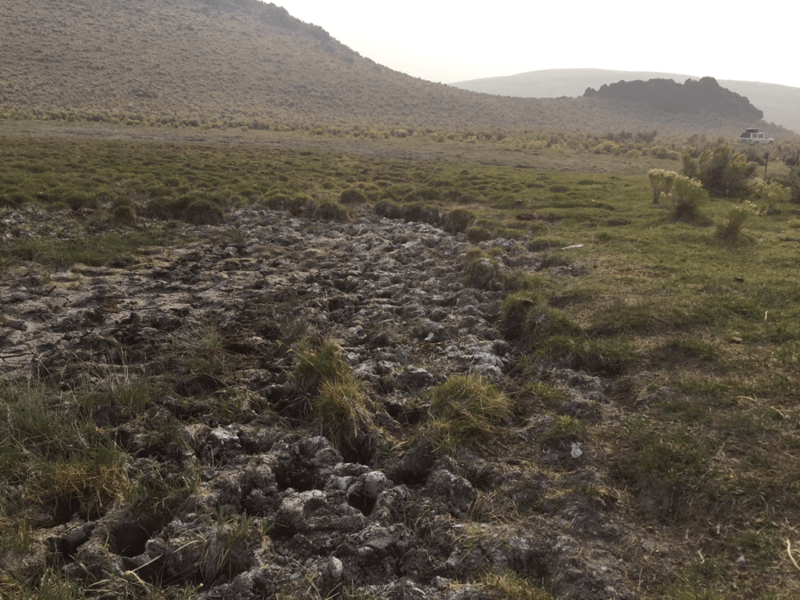 The Donkey Hills Area of Critical Environmental Concern in the upper Pahsimeroi and Little Lost River watersheds is being tragically mis-managed by Challis BLM. Cattle grazing is destroying and permanently drying out the fragile springs, seeps and meadows crucial to sage-grouse and other wildlife. Roads are growing and proliferating inside the ACEC. 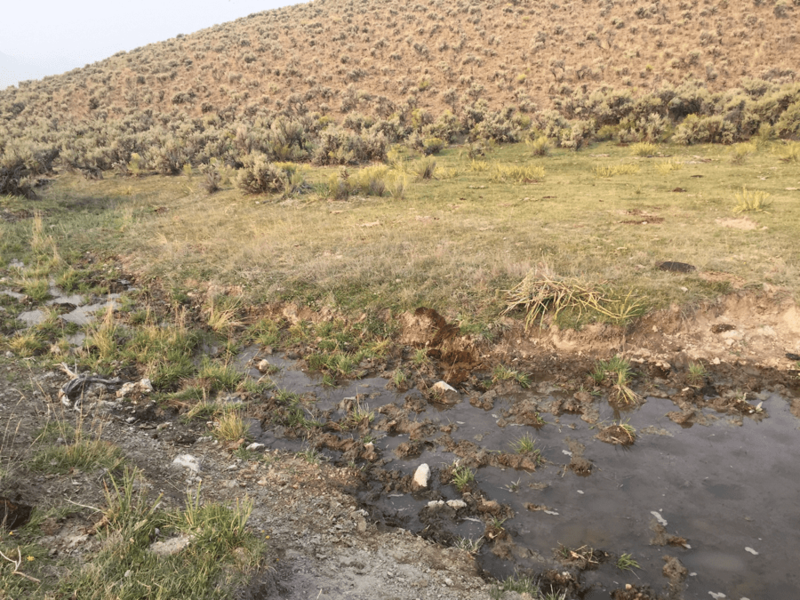 This year, I encountered something that was even further beyond the pale than usual under Challis’s gross perennial mis-management. I’d been visiting this site for decades, and never realized there was actually an exclosure constructed to protect a bit of wildlife habitat here. And it wasn’t just any exclosure – it was a memorial to a person killed in a plane crash nearby. It was built as a joint project of Idaho Department of Fish and Game, the victim’s family, and BLM. The promises made when the exclosure was built have long been ignored. Every time I’ve seen this area that is supposed to be protected for wildlife and clean water, it’s been severely grazed by cows. 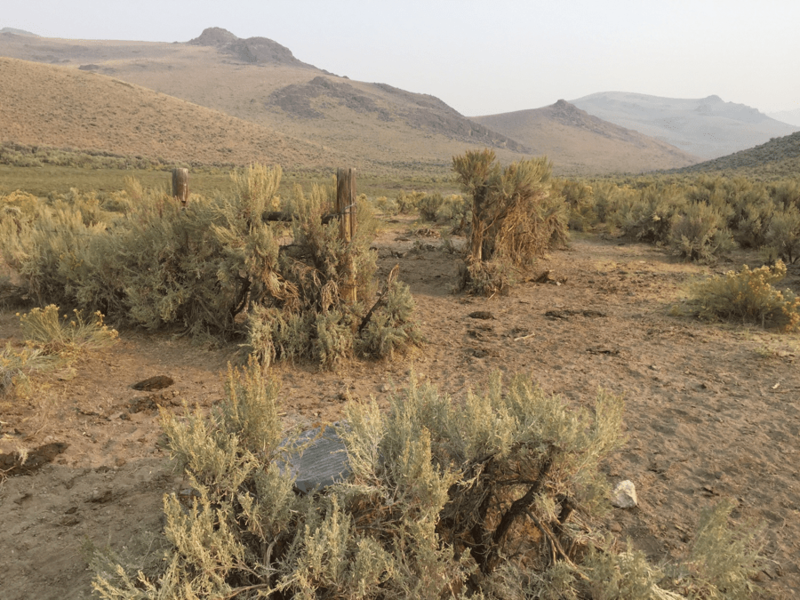 The grazing situation is so out of control across much of Challis BLM land that the sagebrush plants are beat up, and structurally simplified. This year, seeing a bit of structurally complex sagebrush piqued my interest. When I walked over to look at the shrubs, I saw that they were protected from cow battering and breakage due to a large boulder. 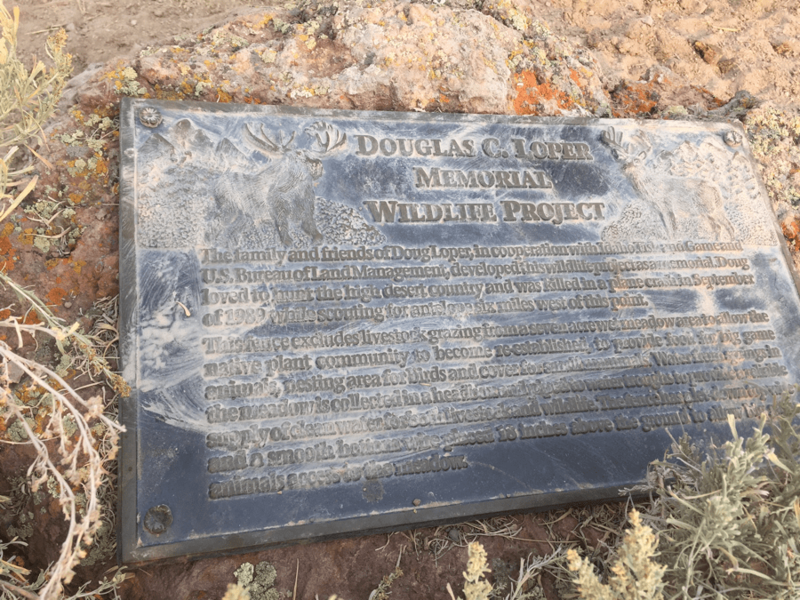 The boulder held a Memorial plaque, describing the genesis of the Loper Wildlife Exclosure. The exclosure fence is down in many places, gates are flung open, and cows have beaten trails into the exclosure over the many years of uncontrolled trespass. 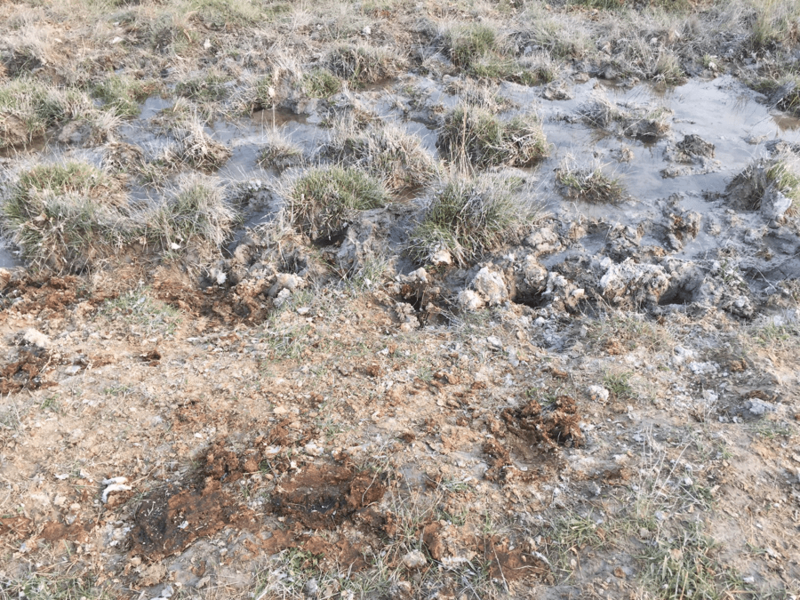 Manure of all ages was present inside– from many years of wanton trespass countenanced by Challis BLM. The fragile springs were pommeled into hummocks from cow trampling, and the interspaces pocked deeply with hoof prints of 1000 lb. cows. 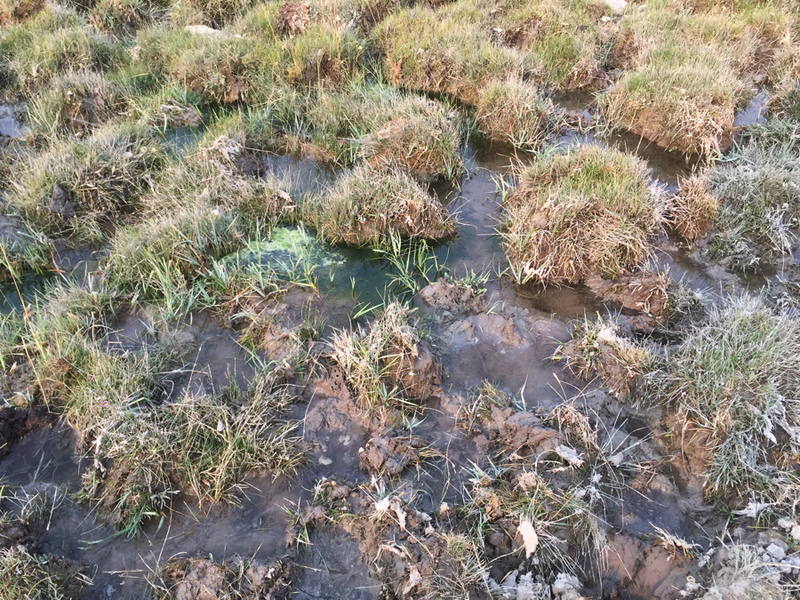 Manure and mud grossly polluted the water. 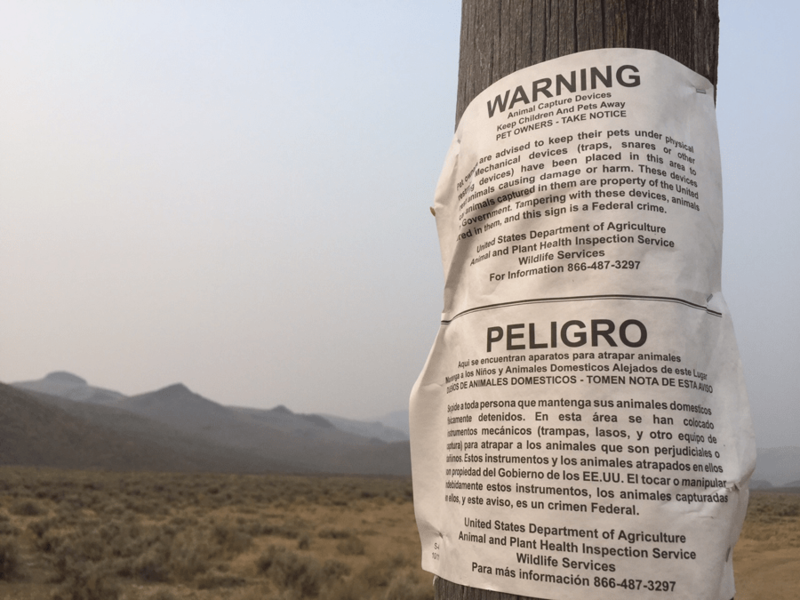 There is large-scale persecution of native predators in the Donkey Hills ACEC and the Upper Pahsimeroi, witness the chilling Wildlife Services “Peligro” Danger signs. 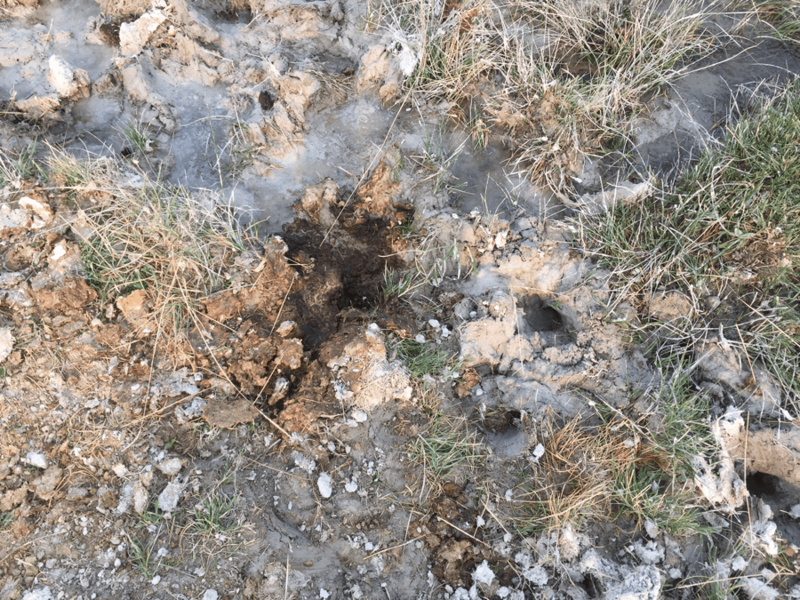 Abusive permittees (the same ones whose cows annually ravage the Loper exclosure) receive further subsidies from the public by having Wildlife Services conduct scorched earth predator killing in the ACEC. Despite such severe degradation of sagebrush structure across uplands in many areas of the Pahsimeroi, and BLM lands managed by Challis and Salmon BLM, as these photos depict, BLM issued a horrible decision that would destroy 6000 acres of sagebrush per year for 10 years, in the Pahsimeroi, portions of the Big Lost and some Salmon BLM lands. BLM claims the sage is too dense. 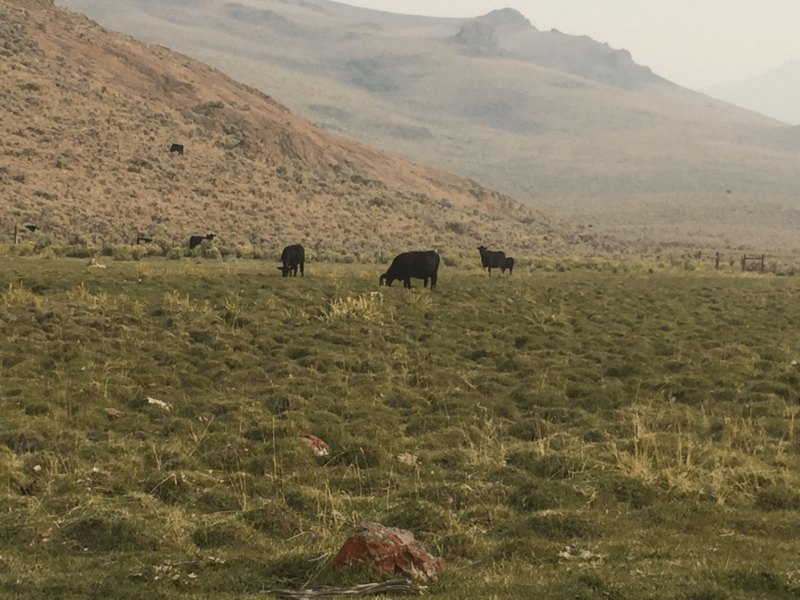 In reality, the project is a scheme to use sage-grouse funds to ravage sage-grouse habitat, and replace the sagebrush with cattle food grasses. 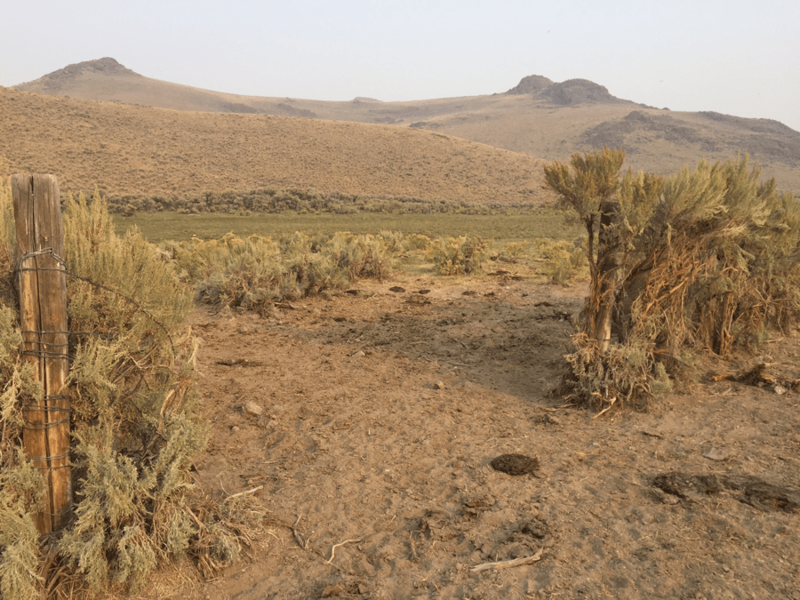 In fact, a primary problem for wildlife like pygmy rabbit (and also sage-grouse nesting in much of this region) is that much of the big sagebrush is beaten and battered by livestock, and greatly simplified structurally. 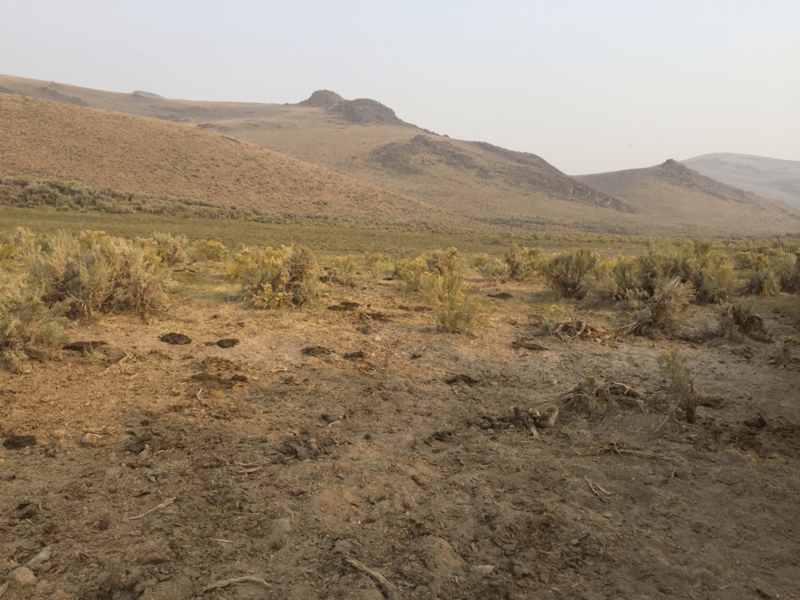 The end result is see-through sagebrush, lacking necessary cover for nests of grouse, songbirds, and for pygmy rabbit survival. 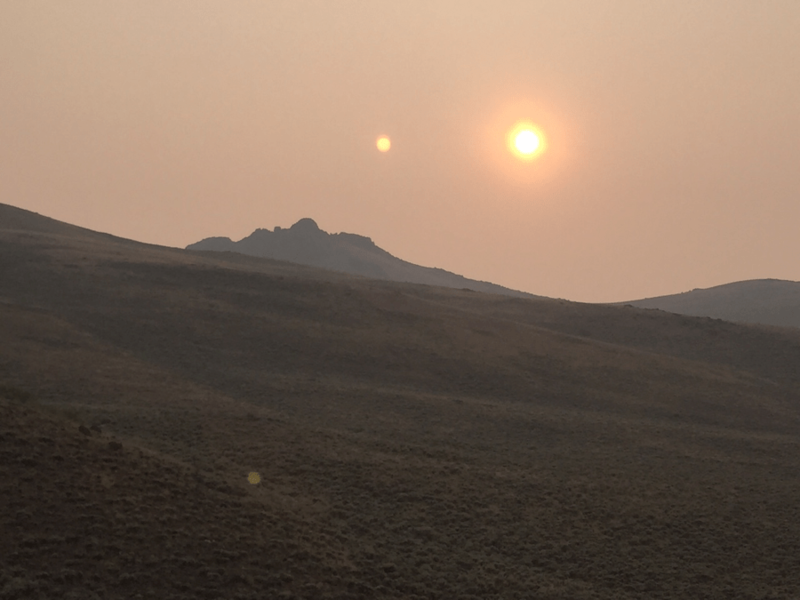 Photos were taken during the period of 2017 smoke inundation of central Idaho from Oregon Wildfires.